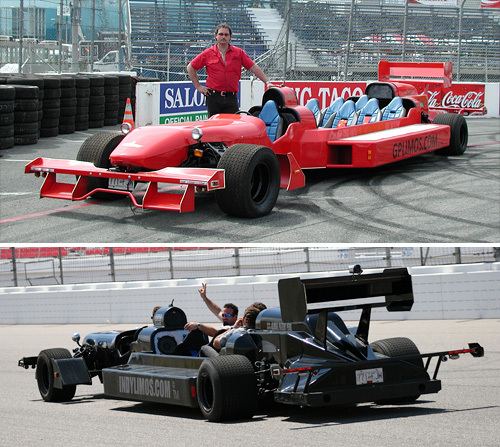 Street Legal GP Limo Seats 7 And Will Supposedly Hit 300 MPH | OhGizmo! At the moment the GPLimos.com website claims the car was actually shooting for a top speed of 300 mph during tests at the Bonneville Salt Flats, but that was over 3 years ago, and given the fact that the Veyron and the SSC Ultimate Aero TT still sit at the top of the record list, I assume things didn’t quite work out as Michael had hoped. Awesome gear, that's so cool it's good for racing. I'm sure racer will love it. Very interesting concept. I would have never thought about creating a F1 limo. They should be careful with the manufacturing agreement so nobody else steals the idea from them. This would be a great car for the F1 fans with deep pockets or just for a fun ride once in a while. Awesome Car. Thanks for sharing.